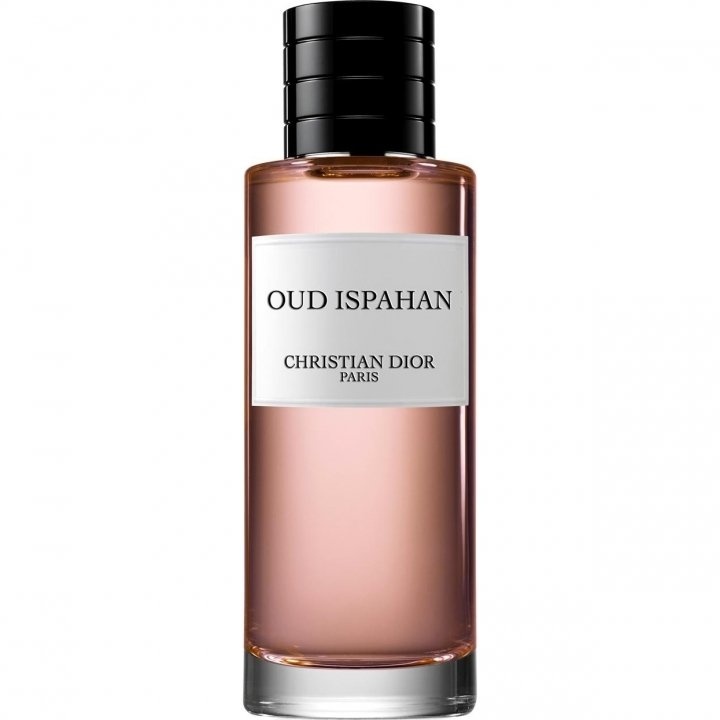 Oud Ispahan is a popular perfume by Dior / Christian Dior for women and men and was released in 2012. The scent is floral-woody. Projection and longevity are above-average. It is still in production. When I read: Labdanum, Patchouli and Sandalwood I am actually very, very curious. So my curiosity for Christian Dior's "Oud Ispahan" was of course special; I still have CD from the past as very sympathetic "on the note". And with two bottlings of "Oud Ispahan" sent to me, something special had to await me. Especially yes, but not in the sense I had in mind. With only five fragrances, which all have something extraordinary about them, a great mixture had to be created. It's not like that for me: I'm mistaken by this scent composition! A resinous, spicy Labdanum chord leads me into the middle of a scent labyrinth that I can't (almost) leave alone. During my escape attempts I meet "my Darling Patchouli" and can only say: Man, how have you changed! Where is the glow, the floating gold, the patchouli embodying for me? Sandalwood and rose say "hello! ", but they seem to be more like solitaires: these scented melanges don't want to combine. The scent is very restless on my skin, as if he were looking for it. Even Oud doesn't find a real station to "dock". I'm mistaken from fragrance to fragrance, try to stir them, shake them: my cocktails used to be quite popular! In spite of very high intensity in durability and sillage, I give it up: we both - "Oud Ispahan" and I - do not find each other! Even a thorough wash does not help; the scent building blocks are still wafting around me for a long time. No matter how often I try and motivate myself with the name CD: I'm standing in the middle of the labyrinth of five fragrances and have lost my way! And it seems I'm not all alone there! So both bottlings of "Oud Ispahan" may continue to travel. My currently very pronounced need for harmony unfortunately does not allow togetherness. Too bad, but not to change! The Old formulation is very good, solid, abit powdery and might not be for everybody specially for those who suffer the powderiness, the strenght of the synthetic materials in their noses...but if you can stand this then it is for sure a good and also unique scent then if masculine, feminine, casual, elegant ...this one is very versitile so each person will think in a different way but overall very very Nice ( a solid Nice and a thumb up ) . The more it stays on the skin the more it becomes feminine anyway..but at the beginning its slightly harsh and maybe more masculine. Initially, a cloud of what smells like superb incense rises, reminiscent of the likes of Craft, Thirty Three by Ex Idolo, and La Liturgie des Heures. Dior's notes for this fragrance don't include incense, but it smells like the beautiful and resinous elemi has crept in. In fact it's labdanum, patchouli and sandalwood showing off like I've never smelled them do so hypnotically, aided of course by a quite civilized oud. Then comes the gorgeous rose which gives this fragrance its name--Rose d'Ispahan, the longest flowering of the Damask roses. Originally discovered in the city of Isfahan in Iran, it was introduced to Europe during the crusades where it eventually came to the attention of the great noses in France--still the center of modern perfumery and the source of most perfumes. Having found this mesmerizing scent, I don't feel the need to explore more rose ouds. I compared it to my seven other rose oud scents and this beat them all, with Montale's Black Aoud coming in a strong second. I could wear almost any of the splendid Dior Private Collection, but this is the one that stole my heart. Think the best rose, the best resins and the best woods you've ever smelled. That's Oud Ispahan to me. Volume and longevity are wonderful. Oud Ispahan is another glossy, sophisticated, particularly silky and clean Western oud-inspired scent, with not much left of the original, animalic “dirtiness” and rawness of Far East’s precious (rotten) gem. Here, the oud note is basically only a tamed-down and polished sort of “dark-smoked” woody note, as scary as a piece of cedar in a Halloween dark costume. Not much else apart from the “mandatory” rose note so many oud scents seem to require these days – I guess to make it softer, trendier and more unisex; and a note of patchouli, basically an earthy-dusty flavor of cocoa floating beneath woods and rose. Despite having not much to do with proper agar wood, Oud Ispahan is undoubtedly a refined, pleasant, luxurious scent exuding “contemporary chic”, with just a hint of trendy shallowness – far superior to Montale stuff, for instance, and many other synthetic ouds we’re used to. This smells a bit artificial too, but somehow classier. Oud lovers may want to stay away from this, while it may suit fans of “French luxury” which want to “smell expensive” with a touch of dark exoticism. The price is surreal for the quality but I feel that wouldn’t be a concern of the average “exclusive” Dior’s lines customer. The first time I tested Oud Ispahan (without much expectation given that being fan of oud had tested enough), was in Paris last April, at Galleries Lafayette. Imagine how, in perfume section thousands of smells permeating the environment, so only a few hours and then tested various perfumes began to notice something amazing and outstanding. A friend of Fragrantica sent me, a few weeks later, luckily, a sample of this, and, miracle, was such, as I suspected! Yes, the one of that rainy and magic day of Paris, which ended in a wonderful late afternoon at Olympia Café taking an aperitif, continuing to follow a perfect dinner the best steak tartare I've ever eaten in a bistrot in the Marais, and finally come to my hotel room beheld this smell that lingered from the first moment. Became the end of my quest for the perfect scent, my Holy Grail! Dry. Intoxicating. Exotic rose but not of bouquets, yes the one you can smell in the hot fields of Iran. And finally oud used subtly (but not hidden) in a fascinating scent of choice in fine tradition of Western school. Compliments? Immense. Known and unknown women, mainly. Makes me feel the Suskind’s character. Excellent scent - I love it. Typically, I don't care for floral scents and I've only smelled one other Oud-Rose combination, which was a bit too feminine for me. Not this one. The oud is dominate here and a bit harsh in combination with the rose. While there is a floral-rose scent, it stays in the background and is light enough to where men can wear it and not have to worry about smelling too feminine. It has immense projection and longevity. Expect to get 12+ hours out of it. I tried to sample Oud Ispahan in Harrods on a visit to London last May, but it was unfortunately not available at that time. The generosity of the lovely Cryptic has enabled me to try this fragrance ... thanks so much for the sample!! The issue is that the use of this type of 'Oud' simply makes everything smell the same ... the use of the genuine stuff would more than likely be cost prohibitive, as I have seen genuine oil going for as much as $30 000 per 10ml. That doesn't stop every other fragrance house from trying to cash in on the action by using the chemical version ... I guess at the end of the day, if one is a committed Dior fan, then Oud Ispahan will suffice. Some of the merits of this fragrance are that it is a very smooth wear, with above average sillage and longevity. At the price point it sells for, these things should be the very least of it's attributes. I can't help thinking that owning a bottle of this juice would, personally, be an incredible waste of money. I have fragrances in this combination of notes that cost way less, and imho are much better than this. While Oud Ispahan is very nice I'm not going to break my head trying to acquire it ... the sample that I have will do for reference purposes and I suggest that if one is on the Oud trail, seek out the myriad authentic oils which proliferate on the net and can be had at a pittance. I personally feel that the Oud wave has crested and find my collection sufficient. Call me morbidly curious. When a close friend with an adventurous and tolerant nose tested Oud Ispahan and found it repellent, I had to see what the stink was all about. To cut straight to the chase, look no further than the oud, or pseudo oud (psoud? ), since we all know by now that what passes for oud these days is just another aromachemical. The specific "oud" found in OI smells to me like the same one that Montale has been using for years. If you find scents like Black Oud appealing, you will probably enjoy OI. In fact, I would rate OI higher than Black Oud because underneath the massive, hulking agarwood is the ghost of a beautiful perfume. The tiny waft of it that manages to escape being smothered is reminiscent of Dior's gorgeous Dolce Vita sans the big peach note. I can just barely detect the same harmonious combination of rose, sandalwood and cardomom that I adore in DV. I can only surmise that the reason oud is present here in such a high concentration is to justify the large price tag. Apparently, someone at Dior figured that more "oud" would equal more dollars. I will say that OI is good value for money in the sense that the sillage is positively intergalactic. I put some on this evening and a short time later my husband inquired from the foot of the stairs, "Dear God, what did you spill up there?" Unfortunately, I can't comment on the longevity because I was forced to scrub, but not before the fragrance had fully developed. It is fairly linear in any event. To compare the experience to something relatable, it was like being in a surgical suite that had been scrubbed with an industrial cleaner, and then being swabbed with that orangey-brown antibacterial solution -- I think it's called Betadine. The anesthesiologist had just eaten a delicious dinner of Moroccan food and I could still smell it on her breath. She was also wearing a dab of very nice perfume. It probably goes without saying that this is not a good candidate for a blind buy. Big thanks to Dig for an interesting fragrant experiment. Perhaps my sample vial has turned but this fragrance smells wicked and not in a good way. It's very strong, offensive, and smells toxic to my nose like sulphur mixed with toxic chemicals. The poor little dainty roses and sandalwood dont stand a chance against this mighty agarwood which threw his weight around and dismissed them as though they were nothing. My body went through a mild state of shock as the headache turned into a stomach ache. For those of us curious about Oud, I can safely say that we shall stay away from this one until our noses have matured enough to accept this strong, off the charts, chemical plant material. I'm pretty sure no one wants to smell this bad. If you still feel the need to sample it, I strongly recommend wearing a safety suit. There really is a bit of Portrait of a Lady's rose open in Oud Ispahan but it smells not nearly as good... And then there is a bit of similar synthetic oud as is found in many Montales, only less believable... Mix in some of Heeley Hippie Rose's annoying patchouli bomb and many other derivative scents and you have this disappointment in a nutshell. Projection and longevity are both truly exceptional. I got in on a blind split of this early-on and had high hopes I would like or even love it, but alas it just is too similar to so many rose, patchouli and synthetic oud scents on the market that I can't really enjoy it as much as I would like. That said, it really is not a bad composition, just a derivative one that is rather overpoweringly strong and synthetic. Someone in a Men's forum post mentioned there is a bit of Black Afgano in here too, and I confess I do indeed at least see the comparison (albeit I don't think there is too much similarity)... Just for reference, this is NOT a good thing in my book. I don't think I will be wearing my split ever again as it is just too much, and there are so many much better rose and patchouli scents on the market for similar money, some less (can anyone say Portrait of a Lady?). I give this "me too" rose patch and synthetic oud scent by Dior 2.5 stars out of 5 and a neutral rating. Not bad, but definitely not recommended. Write the first Review for Oud Ispahan!